No kidding, this review has been like 3 years in the making. That's about how long I've been waiting for tgin to drop a styling gel. Yes, Twist & Define Cream will always hold a special place in my heart. But we all know I'm a gel girl - and the thicker, the better. That's why the second Curl Bomb dropped (and y'all told me on IG Live that I could find it at Sally's), I headed straight there - Bailey in tow and all. 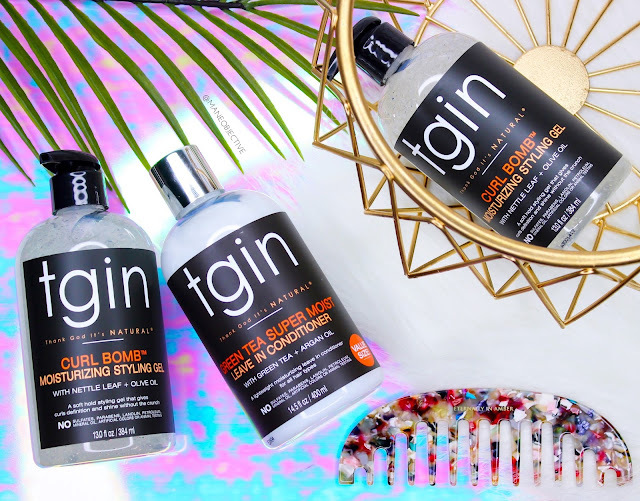 There was a buy 2, get 1 free situation going on at the time with tgin, so I took complete advantage and stocked up with 3 bottles of Curl Bomb Moisturizing Styling Gel, and 3 bottles of Green Tea Super Moist Leave-In Conditioner. Yep, I put my own coins on the table ahead of any sponsored collaboration - because that's how much I believe in tgin. I've been riding with them since 2013. Click here to see 3 pages worth of search results on my blog. Yep, every single time I ever mentioned or wrote about tgin is here. Now, back to the matter at hand. 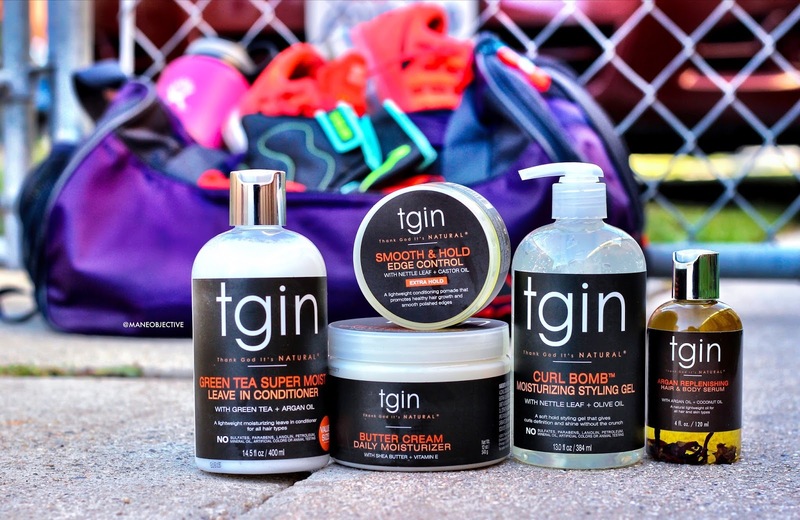 I've been testing and trying out the new tgin Curl Bomb Moisturizing Styling Gel and Smooth & Hold Edge Control. I wanted to have a solid understanding of both before releasing this review, especially the gel. There tends to be so much hype around new products - everybody and their mama is using it, claiming it as their new favorite, rushing to do "hair routine" videos with it, and then two months later....crickets. I got way too much love for y'all and for tgin to go out like that. So do Curl Bomb and Smooth & Hold live up to the hype? Keep reading to find out! PVP/VA Copolymer: Form filming vinyl polymer used as a hair fixative and binding agent (aka provides hold). It's a common active ingredient in many gels and styling product formulas. Maca Root: Peruvian herb dating back to Incan civilization, popular for its healing, beauty, energizing, and overall wellness benefits. Hair products infused with maca aid in thickening and strengthening the hair, with noticeable results showing in a month's time. Black Cohosh: Perennial plant native to North America with thick black roots, believed to stimulate hair growth and prevent hair loss by regulating estrogen levels. Milk Thistle: Flowering plant native to Southern Europe and certain parts of Asia rich in anti-inflammatory and antioxidant properties. The main active ingredient in milk thistle is silymarin, which works to protect the hair and scalp from UV damage and environmental pollutants. Additionally, it works to reverse scalp damage and improve cell regeneration to assist in healthy hair growth. Nettle Leaf: Rich in vitamins A, C, K, as well as vitamins, minerals, and chlorophyll to soothe and nourish the scalp. Encourages hair growth by improving circulation, reducing inflammation, strengthening the follicles, and reducing shedding. Nope. The best gels never are (in my opinion). I believe so - it's free of siliciones, drying alcohols and whatnot, and full of botanical ingredients. You couldn't tell me nothin' in that video! OHMYGODYESYESYESYESYES. I swear, everything Chris-Tia does, she does with excellence. Do you hear me? EXCELLENCE. I haven't met a tgin product that I don't like. I've been rocking with tgin about as long as I've been rocking with Samuel - and both of 'em are keepers for real. Ok, fine. Samuel's been around since 2010. But still. You get my point. Curl Bomb is now a part of an elite squad known as Gels I Never Wanna Run Out Of. Yes. Curl Bomb is up there on my shelf rubbing elbows with Obia's Curl Enhancing Custard, Wonder Curl's Get Set Hair Jelly, Up North Naturals 8-Oil Defining Gelly, and Eco Styler with the red lid. First of all, I LOVE the consistency. It's a thick gel's gel. Sliiightly thinner than my beloved red-top Eco, but every bit as spreadable, and curl capturing. It gives me beautiful definition, long-lasting wear (I can easily get 5 days out of this gel), and isn't flaky or drying. I mean, my hair does need re-moisturizing by about day 3, but that's with any product I use. Adding moisture to the hair between washes is par for the course when it comes to natural hair. The gel cast is there (which I expect and look for in a gel), but it ain't disrespectful or ramen noodle-y. Those ingredients though? I'm here for all of 'em. tgin about to have me up in Vitamin Shoppe adding Maca and Milk Thistle to my vitamin regimen! They definitely came through with a unique gel formula that stands out from the rest. Curl Bomb bears that signature tgin fragrance - sweet and citrus-y with a hint of floral. Not at all overbearing and incredibly pleasant. To get multi-day wear out of my hair, I let it air dry and shrink to in all of it's glory. On day 2, I typically rock the shrunken look - it is what it is. On day 1 and day 2, to preserve my curls during workouts, I use the same big ol' banana clip you see here. Yep, I haven't changed since then. I also use the banana clip at night to preserve my hair when I'm not banding. In the video, I had somewhere to be on day 2 (I accidentally said day 3 in the video), so I banded my curls the night before. Same method that I break down in this video here. Same scarf too...I should probably be ashamed. 😂 The only difference is, I use the Q-Redew now after taking down my bands, to help remove some of the dents and fluff my hair a lil' bit. 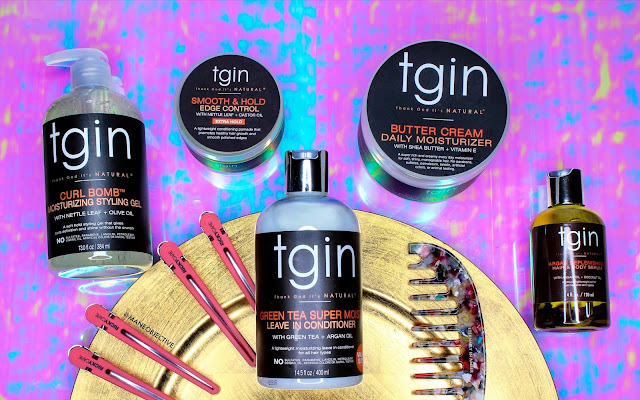 Then I lock in that steamy goodness with the tgin Butter Cream Daily Moisturizer and keep it movin'! Win your own gel, leave-in, and edge control. Details at the end of this post! I'm a firm believer that Chris-Tia and the tgin crew do everything with excellence. From day 1, tgin's branding, packaging, labeling, and ingredient profile has been immaculate. That's why it pains me to say this. I love the profile of the gel in the bottle - the clear contents in stark contrast against the dark labeling is aesthetically pleasing. But functionality-wise - I don't know if it's me or what, but I'm two bottles in and couldn't get the pump to work to save my life! I'm hoping its an early release thing - I've noticed that the two bottles I had issues with had black pumps, and the newer bottles on shelves have clear pumps. Maybe the black pumps were defective, or maybe I just don't know how to do things anymore lol. Either way, a defective pump isn't a deal breaker - I just squeezed the gel out onto a plastic lid and keep it moving. But a jar would've been nice. Listen, ain't no pump finna come between me and Curl Bomb! Definition, shine, hold, touchability, long wear, and playing nicely with other leave-ins and moisturizers are the hallmarks of this gel. It's so dope y'all. I hope you don't think I'm hype beasting for tgin, or I'm being paid to say this stuff. I genuinely love the gel, love the company, and everything they stand for. Oh, and Black woman owned at that! Plus, the pricing is pretty on point. Most curl definers come in 8oz packaging, so I can always appreciate that tgin tends to up the sizes on their products to give better value. If you want to see Curl Bomb in action, check out my video demo below! But as promised, it's so much more than a "look at my curls!" video. tgin was so dope as to partner with me in my healthy living journey - so we headed to the gym! Yep, you've got all access to my workout of the day! In this video and the other video/blog content that follows, I'm hoping to do a few things. One, make myself publicly accountable to my goals and start being more visible in the discussion about achieving healthy hair through a healthy body. Two, dispel the notion that healthy living is for people of a certain "size". And three, to show that there's more to gym life than endless cardio, booty exercises, and 5 lb dumbbells. Hopefully I can inspire other women who look like me to shed the self-doubt and go #beastmode! Enjoy! 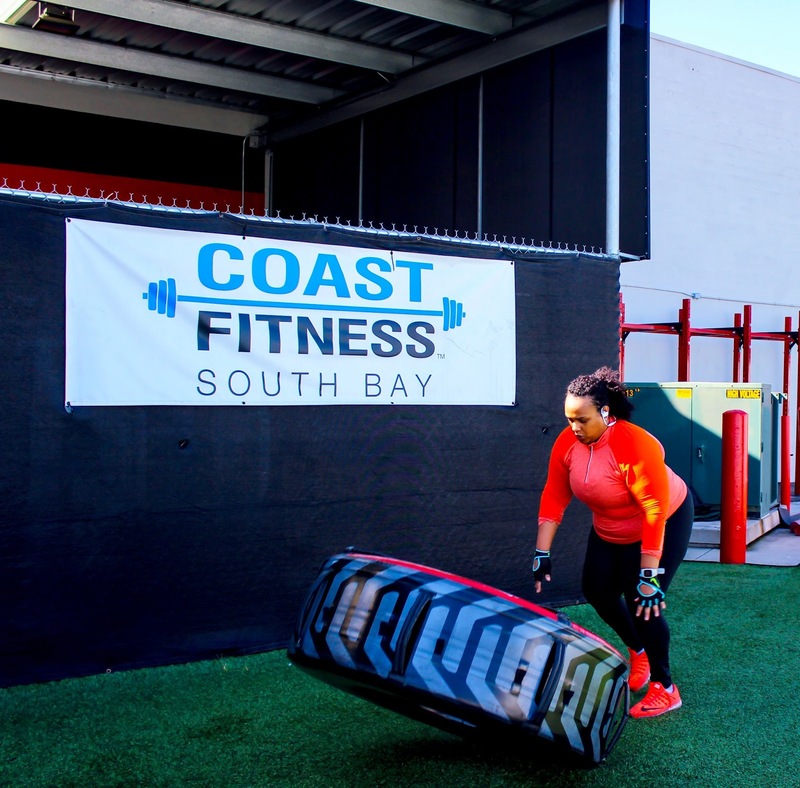 #Shoutout to +Antoinette Arrington of Sup+Dine for being my videographer + photographer at Coast Fitness. Definitely check out her work on Instagram here, and here, and her blog here! Nettle Leaf: Flowering plant native to Southern Europe and certain parts of Asia rich in anti-inflammatory and antioxidant properties. The main active ingredient in milk thistle is silymarin, which works to protect the hair and scalp from UV damage and environmental pollutants. Additionally, it works to reverse scalp damage and improve cell regeneration to assist in healthy hair growth. Ceteareth-25: Derived from cetearyl and stearyl alcohols (the good fatty ones), and used to stabilize oils while thickening and creating a gel-like texture. PEG-40 Hydrogenated Castor Oil: Polyethylene glycol derivatives of castor oil used to help form emulsions by reducing the surface tension of ingredients, also acts as a solvent to help ingredients mix that normally would not. Believe so - no silicones, drying alcohols, etc. and full of the same botanical goodness as the gel. I'M NOT GON' STOP YELLING ABOUT TGIN. I'm not. First things first. Soon as I open the jar, the fragrance makes me smile. It's absolutely amazing and similar to Curl Bomb in that regard. It bears the signature jelly/jam consistency of most edge controls, but is remarkably smooth and not gummy or tacky. Prosperous edges is my wish for all in 2017. Just, sleek, shiny, and prospering...out here loving on themselves in 2017. Smooth & Hold DID THAT! It gives me long lasting, all day hold without issue. I reapply it daily with no gunky buildup problems, and it washes out easily. To boot, I absolutely love the botanical ingredients! After all it's 2017, and everyone deserves flourishing edges. You don't need any fancy contraptions to #laythemedges with Smooth & Hold, just a baby dollop and a finger will do ya. Not a peep from me. I'm in love. Unique ingredients, an excellent product with a flawless performance (in my book). Easily one of the best edge controls I've ever used. I gotta find in on the shelf first! I've had a dickens of a time finding it. It seems to always be outta stock at my local Tarjay stores... maybe that's a testament to how dope Smooth & Hold is! Per the FTC, I have to let y'all know that this post, video, and giveaway is sponsored by tgin. And there's affiliate links in here, meaning if you click the Amazon or Target link and purchase the products, I'll make a few coins. Y'all don't mind, right? Even though this content is sponsored that doesn't mean anything - I'm still keeping it 100 and giving you guys the real. Plus I bought it first with my own money sooooooooo lol! My biggest challenge is defining my natural curls! I have tried many times and I can only get my ends to show its true curl pattern and I would love to be able to get it to be the same all the way down to my roots! I have problems with dry patches in my scalp. I just can't get rid of it no matter what i do it keeps coming back. My biggest challenge I'm having with my transitioning (from heat damage) transitioning hair is retaining moisture. I've been transitioning for 23 months and I'm still trying to figure out how to keep my hair moisturized. Not sure if you've tried cold rinses, but I've found it has been the best for locking moisture in for me. My biggest challenge is single strand knots. I deep condition weekly, get regular end trims but they still come back. Especially in the back. My biggest challenge with my natural hair is installing and retaining moisture in the sections of my hair where it is extremely low porosity. My biggest challenge right now is wash and go. I can do finger coils and my hair looks beautiful and the definition last long. I also tried twist out and I like it. But for some reason the wash and go is not coming out the right way. I still playing around and trying different ways to make the wash and go last. I embrace the shrinkage but when I do wash and go the hair shrink way too much and my curls are not as defined. My biggest challenge with my natural hair is keeping my hair moisturized while maintaining definition in the front of my head which is a much straighter texture than the back of my head which is a 4B. This drastic difference is the result of a change from when I was diagnosed with lupus and began losing my hair and the hair that has grown back is so different from the rest of my head. Now I am just hoping to find products which are able to help hold and define the curls but not weigh them down because my hair in those sections is now so fine. Girl I don't have any real issues with my hair except buying every product you like :( Lawd!!! I'm trying to hold out on this one. I promised myself no more products til I make a real dent in my stash... Ay yay yay!! CHILE....ain't she a bad influence! Lol! My biggest challenge is faking the volume of my first day hair that I have in my three day hair. My hair has incredible shrinkage but I am not complaining because that's a sign of healthy hair but I have developed several techniques to elongate my curls. Something I struggle with is giving my hair added volume without additional frizz,and mainly learning not to overload product onto my fine strands. Biggest challenge is that I can't wash and go. I've been transitioning for almost two years and I still have straight pieces so a wash and go 1) looks crazy and 2) stringy because I'm struggling to clump my curls. #takemetotheking. Getting my final chop (prayerfully) May 6th. I'm barrerachel on Instagram. Biggest challenge when I was transitioning was trying to determine what worked well fir my natural curl pattern and what didn't. I wasn't able to sorta figure it out until I was FULLY natural in 2013...I still struggle but not as much. My biggest natural hair challenge has to be single strand knots. Awesome results! My issue is dryness, I've always had dry hair & scalp! Hi! Another of my challenges is hair color recovery. I've dyed my hair jet Black almost since going natural, and I worry that I'm too far gone to be able to experiment with other color. I know you do a lot of home color, but have you seen a professional and would you advise it? My biggest challenge with my natural hair journey is STILL dealing with my crown. That area is so different from the rest of my hair in every way and I really struggle to find the right ways to moisturize and style it. My biggest challenge has been patience. 2nd entry! I think another problem I have is heat damage. I've never relaxed my hair so any damage I had was strictly heat. Now I'm still trying to figure out how and if I can use heat on my mostly recovered hair. Even when getting braids it seems like you need heat to stretch hair. Keeping my hair moisturized and trying to have a successful wash n go are my biggest challenges with my natural hair. I enjoy your facebook and Instagram post. What I love most is your honesty about hair, fitness goals, life...oh and the shoes. Another natural hair challenge for me is my scalp. Since returning Natural I find that my scalp gets dry no matter what I do. Finding ways to combat it has been a hassle! My biggest challenge right is breakage and thinning of my hair. I'm trying to take better care of my hair and body, which I suspect is a main source of my hair issues. Finding products light enough for my fine, low density hair but heavy enough for my wiry greys. 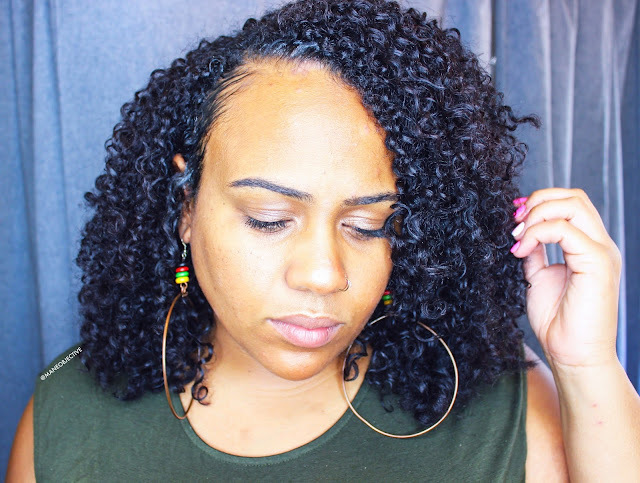 The biggest struggle for me from transitioning from relaxed to natural is then dealing with the struggles of heat damage because of lexcessive heat styling and ack of knowledge on how to style my natural hair and finding my texture. I'm still finding my texture. I'm still hoping some bomb curls will come through one day without me having to big chop. Another problem I have is judging when to get a trim vs doing it myself at home. 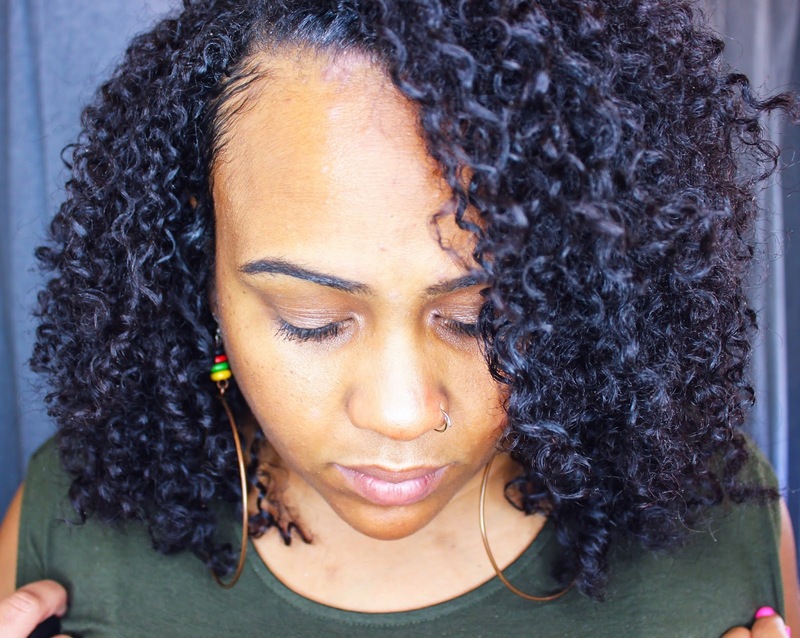 When I first went natural, I tried trimming on my own and my hair became totally uneven. I researched a ton and found that DevaCurl might be the best option for getting a haircut. I went and saw a DevaChan stylist and LOVED it, but I can't afford $80 more than maybe once a year! I've been trimming on my own since then (twist and trim the ends of the twists) but I want to keep a good shape and not end up uneven like my first phase. Do you do home trims, and if so how do you do them--or should I always rely on a professional? Also, do you have any opinions about trimming when the hair is straight vs curly? My biggest challenger with transitioning is trying to get good results every time. My hair being hit or miss is hard especially when I have events. The other is getting volume. Even when I do everything "right" my hair is not defined and has no volume. My biggest challenge is time management. Finding the time to style, wash day, and do my everyday mom things is hard. I'm still transitioning so I'm sure my journey will get easier once I get a consistent routine but right now I'm still and the trail and error phase and it can be frustrating. Hi! Through out my hair journey from relaxed to natural, moisture and breakage of my strands have been a major concern and dillemma. Now that I'm fully natural rocking my 4a/4b/4c hair now,trouble with defining my curls has made my hair woes triple! As a college student currently pursuing my BA in Biology, it's hard finding the right products that are within my budget, and managing the time restraint I have to care for my hair on a daily/weekly basis. If you could just give tips to help solve some of my problems I would love it , either via Instagram(patrecemase) or YouTube (Patty M). Thank you so much for the opportunity to win some lovely products. Okay, I think the last challenge I have is trims. I found out of a way you can do it by yourself but I still prefer going to a professional which takes alot of money depending, so I usually hold off until I really feel like its time. Very informative post. Thanks for sharing such an interesting and informative information. Really helped a lot. Hello, in my 6+ year struggle to find the right product I have never once tried anything from TGIN. It just seemed mostly marketed to coarser, coilier hair textures, but your results are stunning and now I'm very tempted to try their products. Would you recommend this line to a fine-haired, 3b European person?